Live on Kickstarter, SwitchPod works with any camera, from a phone to a DSLR, and simplifies video making. 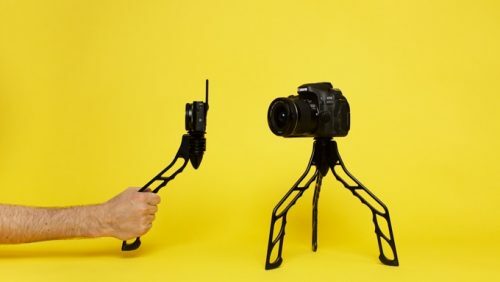 San Diego, CA, United States - March 18, 2019 /MarketersMedia/ — SwitchPod, the revolutionary new tripod that instantly switches to handheld mode and back in seconds, is live on global crowdfunding platform Kickstarter and a breakout success having already raised over $350k. Anyone that’s ever tried to film themselves knows that it’s harder than it looks. Trying to walk while filming, the curious looks from bystanders, and the overall difficulty in trying to carry a bulky tripod in one hand while trying to keep the camera steady and aligned. Enter the SwitchPod- a lightweight, versatile tripod that instantly flips back and forth between handheld and tripod mode making filming easier than ever. SwitchPod works with any camera. No more fussing with tripod mounting plates, our embedded 1/4-20" standard tripod screw and tightening knob will help attach any camera in seconds. Magnets help to keep the legs collapsed together while in vlogging mode, but are gentle enough that, with the flick of your wrist, can easily switch to tripod mode. Despite its lightweight design, the SwitchPod is also incredibly strong and made of an aluminum alloy; capable of turning the SwitchPod into a full video rig. Studio Jigowatt, LLC, founded in 2018 by Pat Flynn and Caleb Wojcik, designs, develops, and produces products for creators, made by creators. SwitchPod is their first physical product, inspired by filming hundreds of videos over the past decade.